Garrison Essentials Como Repp Stripe Tie. Our latest release from Essentials is a classic Repp Stripe pattern with a tonal and textured contrast in 100% Silk. A core staple in any man's wardrobe, handmade from our small batch maker in Como, Italy. Exclusively for Essentials at $55. 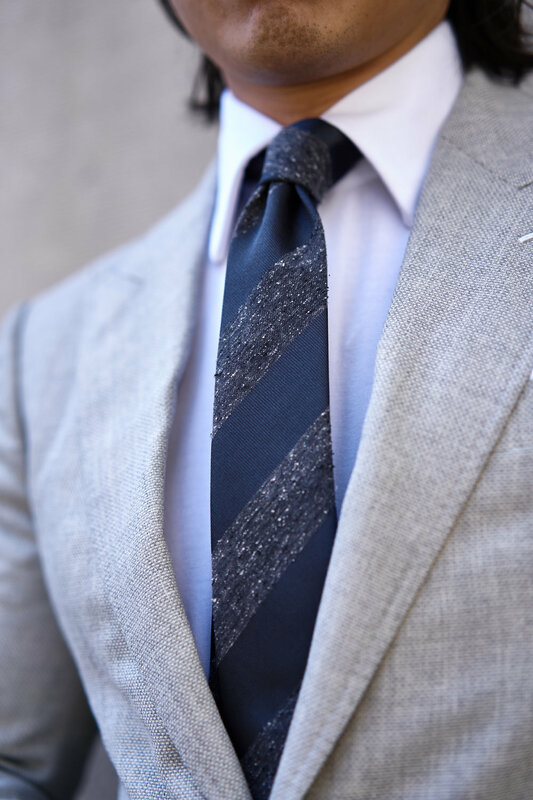 Classic, without feeling stuffy, our repp stripe tie adds that extra pop to core tailoring looks. We made it slightly slimmer from our core collection at a 7cm width. The tonal contrast blocks and touch of texture adds that extra visual interest and modern appeal. Available in Purple, Charcoal, Navy and Brown. In limited quantites.